Private luxury hot tub included + pet friendly. 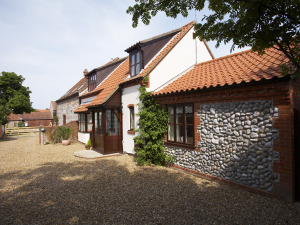 Luxury cottages Norfolk. Stable Cottage has just been upgraded, see our website for details. In a pretty fishing village is Stable Cottage, part listed and very luxurious. The frontage is handsome, the setting is leafy, the seclusion is delightful. Nick and Barbara welcome you on arrival and give you the tour. Wow, what a cottage - think show home instead. Mattresses are firm, linen is new, there's a garden room for kids (table football, PlayStation, a DVD player and a flurry of games), a gourmet welcome pack with a bottle of wine, and a flat screen 42 "TV in every room - and that includes the bathrooms. Bedroom - the two upstairs having leafy views, the twin sitting prettily under the roof - are smart, pristine and enlivened by Grundig surround sound. Curtains are of thick damask; furniture is crafted from American oak, bathrooms sparkle and has heated rails for fluffy white towels. Downstairs, glass doors framed by lush gold curtains glide to reveal a secure garden in apple-pie order and a hot tub topped by a hat of thatched - wallow with a bottle of bubbly under the stars. Quaint Cromer - Blue Flag beaches, pier with theatre - is a pootle down the road; East Runton's sands are a stroll away. Norfolk's coastline is a joy. Cycle hire available in Cromer, 1 mile away. (Peddle Revolution) Children welcome from any age. Stable Cottage Luxury Self Catering offers weekly bookings starting on Friday and short breaks of 3 days starting on Friday and of 4 days starting on Monday in some seasons. From Holt take A148 to Sheringham & Cromer. After about 4 miles, turn left to Sheringham (A1082). After 1 mile turn right at roundabout & travel along coast rd (A149) for about 3 miles from Sheringham, going through West Runton, to Cromer. Turn into Felbrigg Rd (opposite Fishing Boat Pub) & take 2nd turn left into Incleborough Close. When in Incleborough Close turn right & cottage driveway is in front of you through open gate. You can contact us by pressing bell on right hand side of wooden gate on wall opposite cottage front door. Extremely well equipped cottage, in the middle of a lovely seaside village. The service we received from Nick and the Luxurious Cottages staff from booking to heading back home, was of the highest quality. Nothing was ever too much trouble for them.